Well now it's time for the second part of my review of hobby related activities for the past twelve months. Here I will look at the progress that I have made with expanding my existing Space Marine armies in 2017. This has been a relatively good year for my Adeptus Astartes and I have really enjoyed expanding these elite superhuman Imperial forces... To be honest they will always be my favourite war gaming faction. So 2017 has been a relatively busy year for me on the hobby front; so much so that I'm going to have to divide my annual review into multiple posts. After a thoroughly enjoyable game of second edition 'Epic - Space Marine' with my best mate last weekend I have suddenly had my interest in 6mm toy soldiers reinvigorated once again! In truth it has been a while since I've worked on any Epic models (3 years since BOYL/ Oldhammer Day 2014 as it goes) so I was quite excited to get back on the micro warrior bandwagon once again. 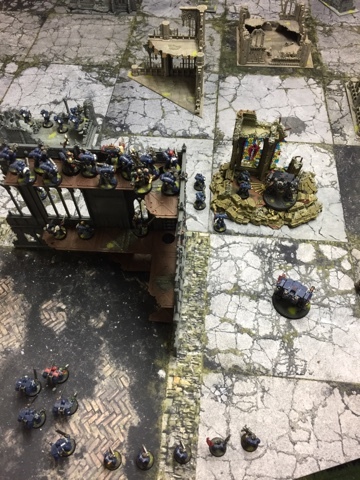 So after a fairly long break of a couple of years I decided to finally get back into the 6mm scene with a long overdue game of Space Marine: Second edition (aka Epic). To facilitate this my best mate and I broke out our vast armies and set about undertaking a full day of gaming that I have to admit was some of the best fun that I've had in ages. We decided to stick to the game's name and keep things suitably 'epic' by setting a massive point limit on the game of around 7000 points. It was my birthday recently and my long-suffering other-half was gracious enough to get me something that I had been lusting after for some time... An airbrush and all the trimmings! Now this is an acquisition that I have been considering for a number of years but I have managed to talk myself in and out of purchasing one multiple times. Finally though I decided I wanted to make the move into airbrushing and thus set about researching the subject fully as a decent brush is an expensive commitment. Now there is loads of information and guidance on the web from other hobbyists...but the trouble is nearly all of it is contradictory. Eventually though I established that both a high-quality airbrush and compressor were vital to achieve good results... 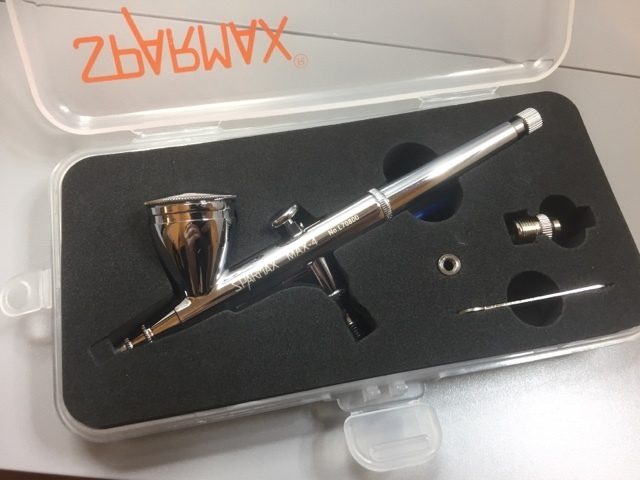 It is clear that there are some names on the market that seem to dominate the airbrush industry (Iwata, Badger, Steinbeck) and these are acknowledged as the premier league of airbrushing... However a little bit of digging revealed something quite interesting, it seems that many of these top-end airbrushes are actually made for these market leaders by another company... yes it seems the less well-known company Sparmax actually manufacture models on behalf of the other firms who then just add their own branding. With this in mind I decided to look at Sparmax's own products and found that they were of a comparable quality to more well-known competitors but at a significantly reduced price (though they are still by no means cheap). The more research I did the more I was confident that this company could provide me the tools I needed at a reasonable price. So I've been away on exercise and assorted training packages with the Army for the last month which explains my prolonged absence from this venerable blog. I'm pleased to be back home and more importantly back in my painting chair. I've just finished my first unit of Primaris Space Marines so I thought I'd post them up here for you all to see. 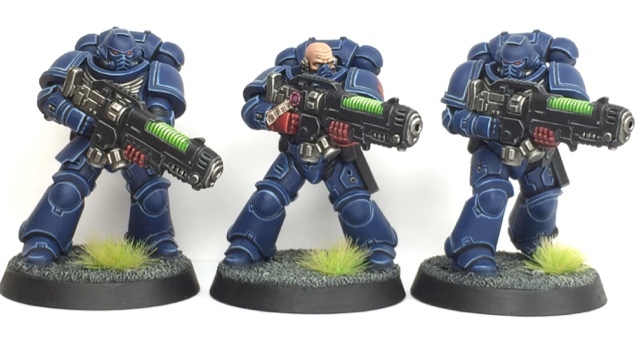 I initially considered starting a whole new chapter of Astartes for my Primaris models, but then I decided I'd actually prefer to slip them into my existing force of Crimson Fists and so I broke out the blue paint and went to work. 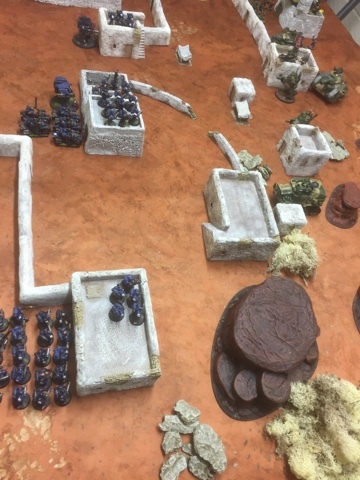 So I had my mate over to my house the other day in order to play a game of the new edition of Warhammer 40,000; as previously stated I am a massive fan of the new version of the rules and as such I was keen to get another battle under my belt. 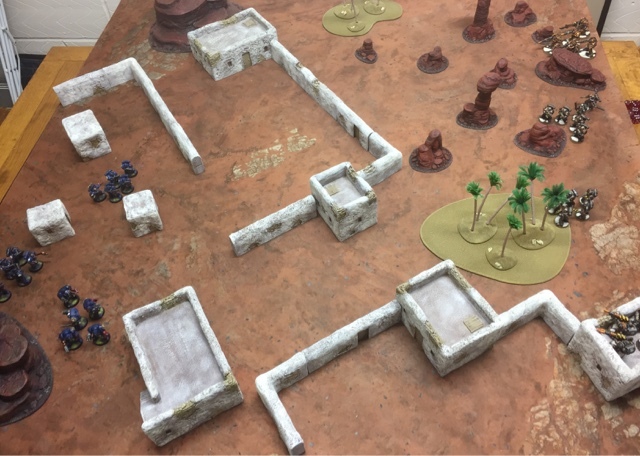 The majority of members of my usual gaming group are casual gamers and so we use the fairly informal but relatively balanced Power Points system to put our armies together. This system is ideal for quickly assembling a force and provides a fairly equal fun game for the majority of situations... Though it is vulnerable to exploitation by power gamers! So having played a few games of eighth edition 40k recently it has become clear to me that special characters are much more useful in this new version of the game! 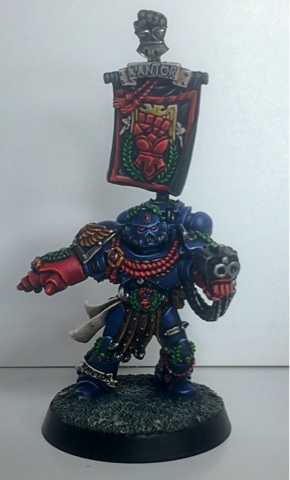 With this in mind I decided to replace the venerable brother-captain who has been leading my force of Crimson Fists since 2002 with a new commander! 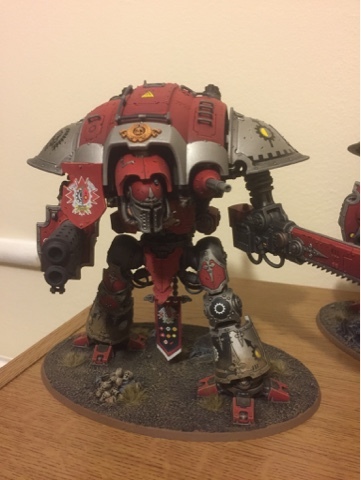 Clearly there was only one choice of new Warlord for my force.... Chapter Master Pedro Kantor! It is amazing how a bit of effort and time can breathe new live into certain hobby projects. 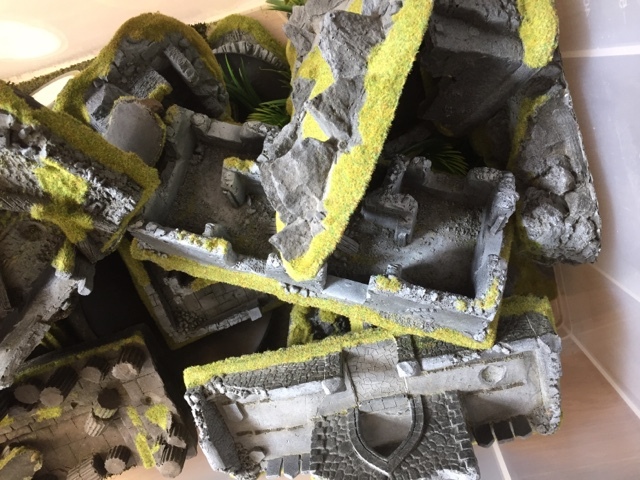 Recently I was clearing out my hobby storage bunker when I came across a big box of JAVIS resin scenery that my best mate and I bought in 2004 when we got back into the hobby. Most gamers in the UK are probably aware of JAVIS products but I'm not sure how well known they are in the international community. As a company their roots lay in producing model railway scenery, but a few years ago they diversified in into making wargames terrain for the 20mm-28mm market. So this weekend one of my best mates was on leave from a tour of duty with the Royal Navy and we got together to play a game of eighth edition. This was my third go at this new system but it was his first so we kept the Army Lists deliberately simple in order to let us pick up the rules without too much complexity. For me this was also the perfect excuse to try out my latest gaming mat which is the beautiful 'Concrete, 6x4 mat' from Martin and the team over at URBANMATZ. I have loads of mats from these guys and I can't praise them enough! They make the tabletop look awesome and roll up which is means they can be stored easily, something that is vital when storage space is at a premium. 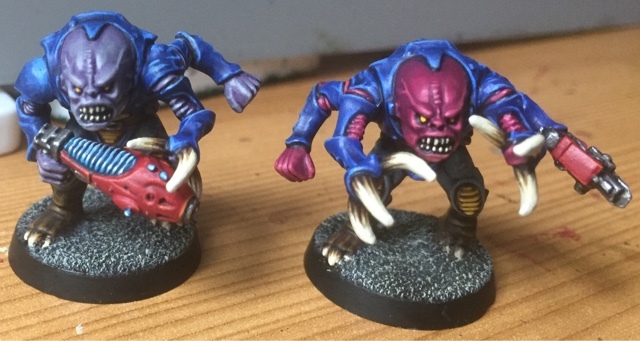 Over on the Oldhammer Forums there is a pretty cool challenge in the painting area for people to post pictures of Fantast models that they have never attempted before...so here is my attempt! Loads of skeletons! I've just got back from Bring Out Yoùr Lead (BOYL) 2017 and what a great time it was! After having missed the event last year I was determined to make it in 2017 and I'm very pleased that I did! 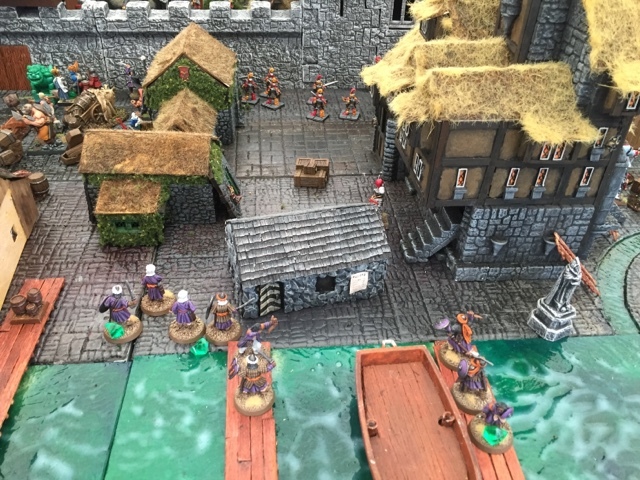 The event was better attended than ever before and there was a huge mass of gamers assembled at the Foundry playing a vast plethora of games ranging from Space Fleet through to Mordheim. It was great to see some old faces and I quickly got re-acquainted with various stalwarts of the Oldhammer scene including Curtis who was running the Helsreach Table, Geoff, JB (Asslesman), James Holloway and Steve (Thantsants)! Everyone was in high spirits and it was good to catch up, sadly one character was notable by his absence and I was saddened to find Chico wasn't present. Greetings all.... Now... first things first!! We have a celebration to commemorate... this blog that you are reading now is officially four years old as of last week!! 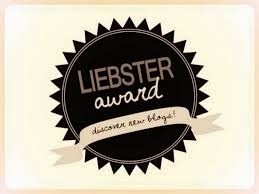 So join me in wishing Happy Birthday to the Blog!! What initially started out as a loose assortment of my thoughts and findings around playing games of Rogue Trader has grown beyond anything that I could have imagined when I started it back in July 2013! In fact this blog has now had over a quarter of a million visits and has a dedicated following of 124 followers! 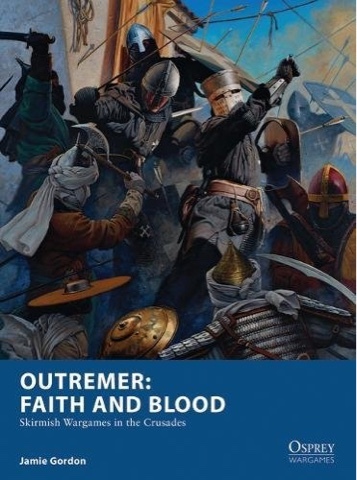 As well as this I have become a regular wargames journalist with frequent articles appearing in Wargames, Soldiers and Strategy and Miniature Wargames magazines, on top of which my first set of wargames rules (Outremer: Faith & Blood) is due for release in April next year! Truly from small acorns do big things grow! Anyway enough reminiscing and on with what you really want to see: Toy Soldiers! 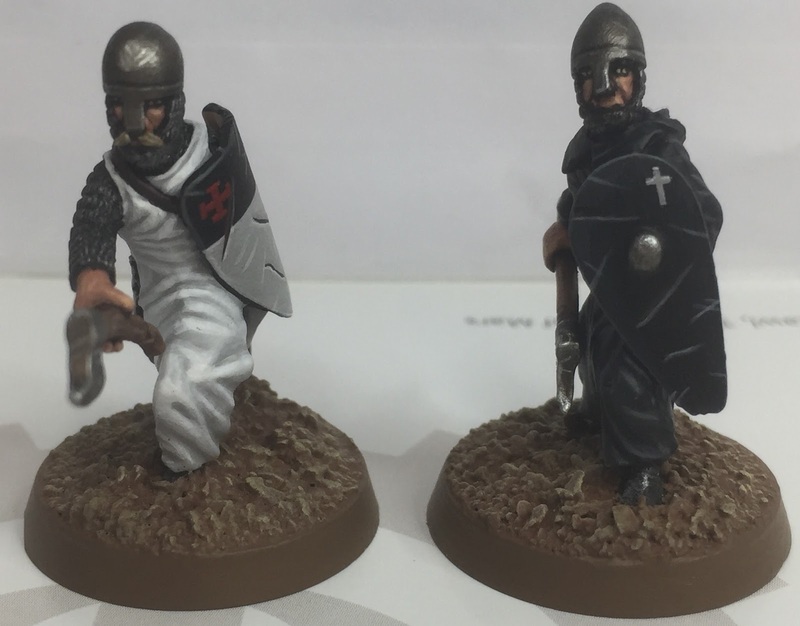 So I have decided to get some more models done for my soon to be published rulebook Outremer: Faith and Blood this week. 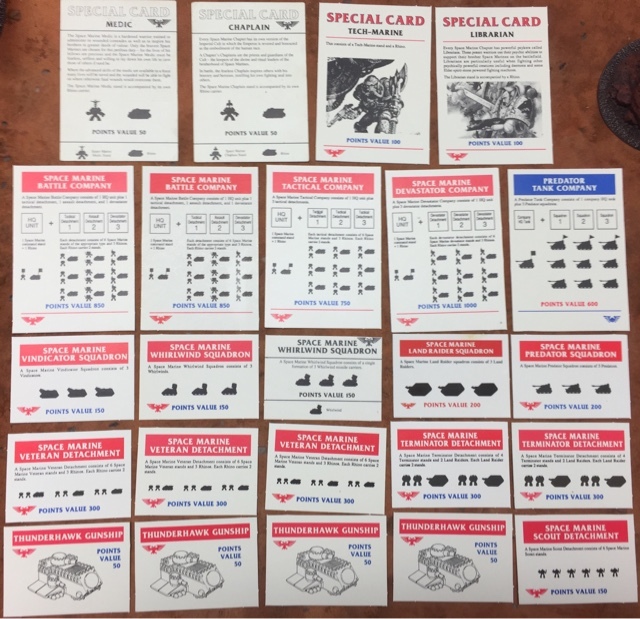 As it is a campaign skirmish game set during the crusades it makes sense to have multiple versions of each character in order to represent different weapon or equipment load-outs during the progression of the campaign. 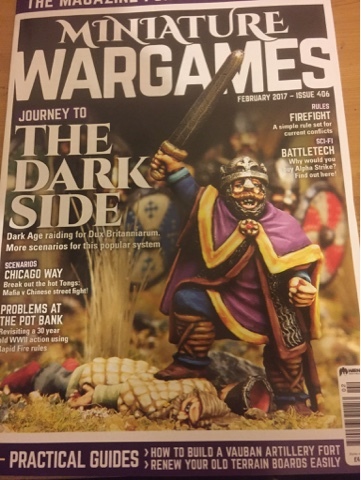 As almost everyone who is reading this post is probably aware already GW have released yet another edition of Warhamer 40,000 in the last week. Now as an Oldhammer-er this wouldn't usually excite me, but having read much of the information released in the run up to its release I have been very optimistic about this new version of the game. It seems to be re-introducing many of the cooler elements from Rogue Trader and second edition whilst also retaining a degree of streamlining to ensure games move at a good pace. 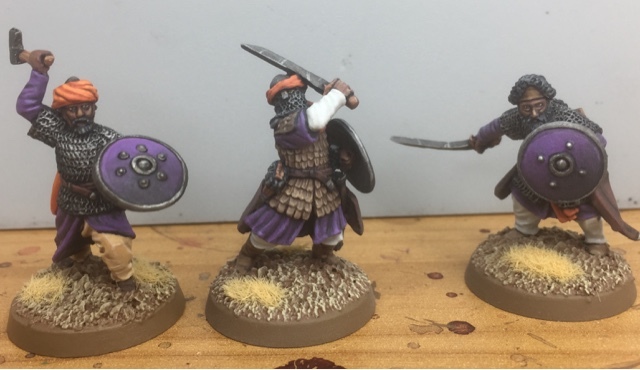 This week I've been working on another one of my warbands for Outremer: Faith and Blood (which most of you will already know by now is my new skirmish game that is going to be released by Osprey Wargames in April 2018). This group of Crusaders hail from Burgundy and I have been gradually building them for the last year; I have gone for a Red and Yellow theme in order to tie the fighters together on the tabletop. 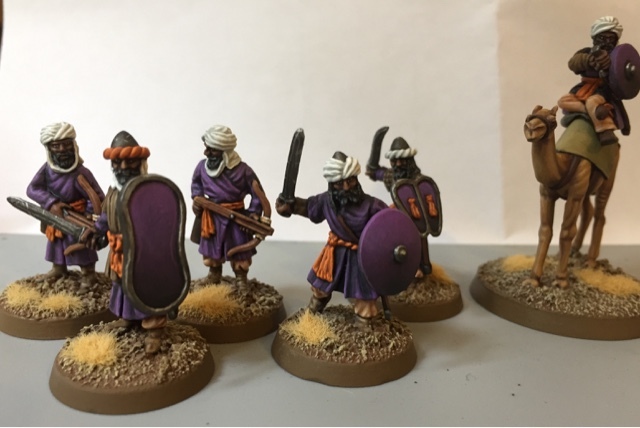 Well this week I have been focussing on finishing off a Saracen/Islamic warband for my up-and-coming Osprey book Outremer: Faith and Blood. 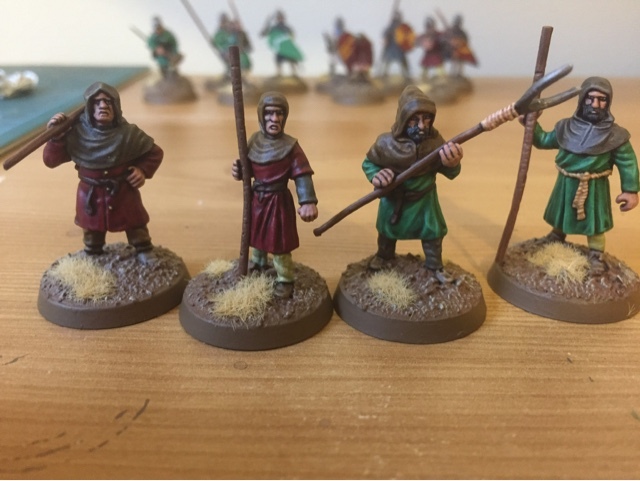 This is the first time I have painted an Eastern themed force and I have really enjoyed it. The models have been sourced from a variety of suppliers as I was looking for a nice mixture of fighters in my warband. Whilst I understand there was no real degree of uniformity in this era I have stuck to a purple and orange scheme in order to tie the force together on the tabletop and also for photographic purposes. The first three models above are my most heavily armoured warriors, two are clad in maille and another one is wearing leather armour. One of these fighters will be used to represent my general and the other two will be his closest retainers. In a bid to keep myself motivated and productive in terms of overall miniature output I have become something of a hobby butterfly in 2017 and I am bouncing between a variety of different projects in order to maintain my interest. So after last week's foray into the exciting world of dreadnoughts I have switched over to another long term project in the form of attempting to expand my slowly growing Genestealer Cult. 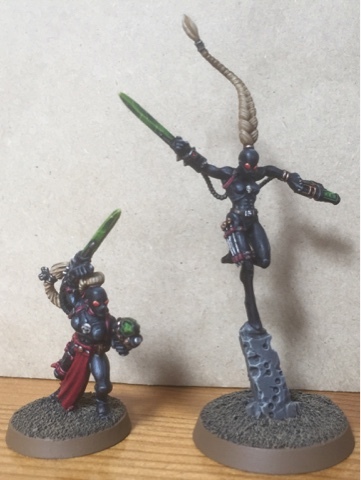 So I decided to take a break from the Assassin Project for a bit as painting predominantly black models can get a bit tedious and I do like shake things up every so often in order to keep my interest up. 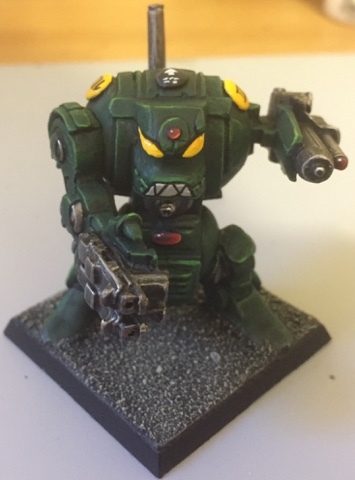 Thus I rummaged through my (fairly large) abandoned projects box and found a 1988 'Rogue Trader' dreadnought that I had assembled and basecoated green in 2013 and a far more modern 'Assault on Black Reach' dreadnought that I had basecoated blue in 2009 just after that specific version of 40k (5th Edition) was released. So now we come to phase two of my assassin project which I completed this week! This time I have painted two assassins drawn from the Callidus Temple. These shape-shifting female killers are pretty impressive fighters who are able to use the drug polymorhpine in order to disguise themselves as an enemy leader's most trusted adviser...and then get close enough to land the killing blow. Can you believe it...1997 was 20 years ago!! That is absolutely mind-blowing! I can't quite believe how old this revelation has made me feel! 1997 is important for us as Oldhammeres as it was the last full year of WH40K Second Edition before the abomination that was Third Edition was introduced in 1998. It was also the year that the original Codex Assassins was released in a small free A4 pamphlet. This miniscule publication refined these sinister Imperial Agents and replaced the old generic assassin with four distinct temples each of which specialised in dealing a different form of death to the foes of the Emperor. As a tribute to that publication and the fantastic models that went along with it I have decided to set myself a little challenge. I am going to paint one of each of this classic models (which were actually sculpted in 1995 according to their base tabs) alongside their recent plastic replacements. Well it is time for my first post of March! 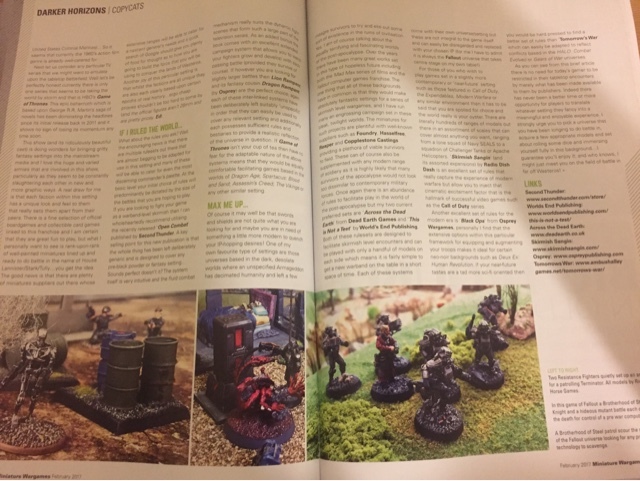 First things first, the latest copy of Wargames, Soldiers and Strategy magazine has been released this week (issue 89) and I am proud to say that it contains an article by myself about the need for a degree of both creativity and improvisation in wargaming as well as some other great articles! So go and pick up a copy! 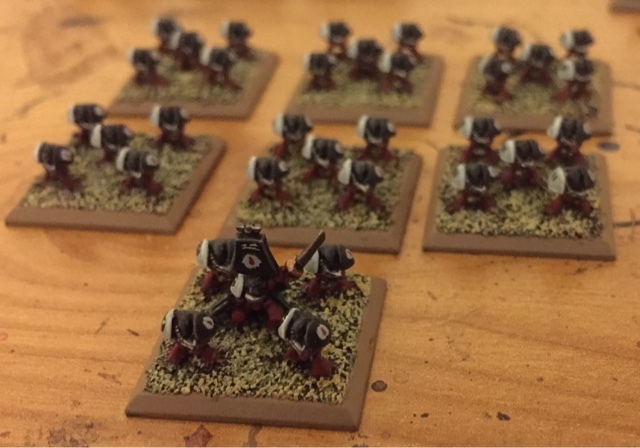 Now more importantly.....let's look at some toy soldiers (very big toy soldiers) that I have just finished painting! As many of you are aware I am in the process of writing a new rulebook for the guys at Osprey Games, a publisher that is becoming a major power house in our hobby. I am pleased to say that the rules are coming along nicely and I am now moving into beta testing the core game mechanics and they are working a treat. 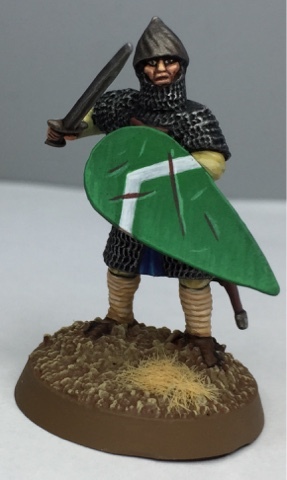 The game is a Warband-level skirmish game set during the medieval period and allows players to recruit, equip, train and develop a band of warriors over the course of a campaign. 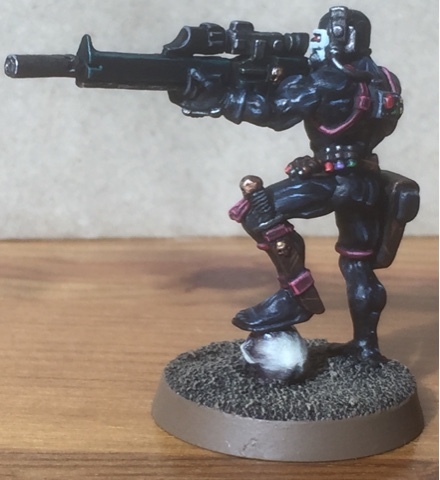 As you might have noticed recently my hobby taste (and thus the source material for this blog) has deviated somewhat from its usual comfort zone of retro Rogue Trader stuff. This has led to me dabbling in various other genres including modern fantasy such as Frostgrave and Historical miniatures such as my Norman Knights. 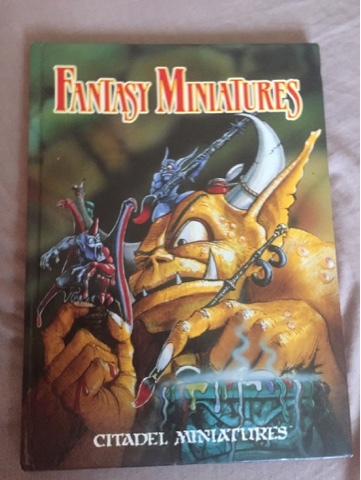 To tell you the truth I just needed a change and a bit of a break from my usual interests (come on... We all need a break sometimes); however I've recently been getting that retro itch again and I wanted to get back into that 1980s/1990s Oldhammer way of doing business! 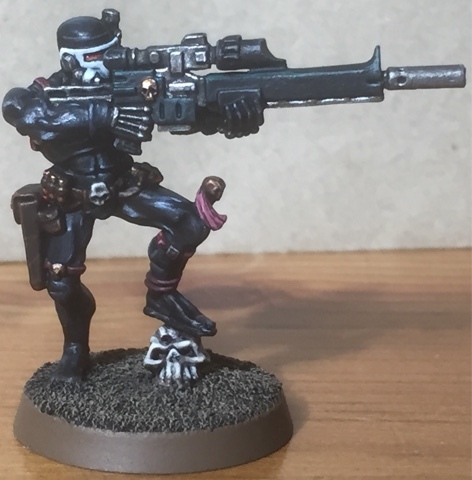 After all...this blog is called Oldhammer 40k, so there is only so far you can deviate before you feel like you are cheating the readership. Anyway I felt I needed some source material to get me back into the swing of things...now I own and have read every single book that came out for Rogue Trader and the same goes for every White Dwarf that was published between 1987 and 1998 (Rogue Trader and WH40K second edition eras)...so finding fresh reading material can be a bit of a challenge! Thus it was with some glee that I found the following publication on eBay whilst trawling through multiple listings one day last week. 2017 is shaping up to be a fairly productive year on the miniature production front for me; mind you I find most years start like this ... then gradually my turn out starts to ebb as time grinds on! This year however I am determined not to let this happen and so my goal is to keep the momentum up. 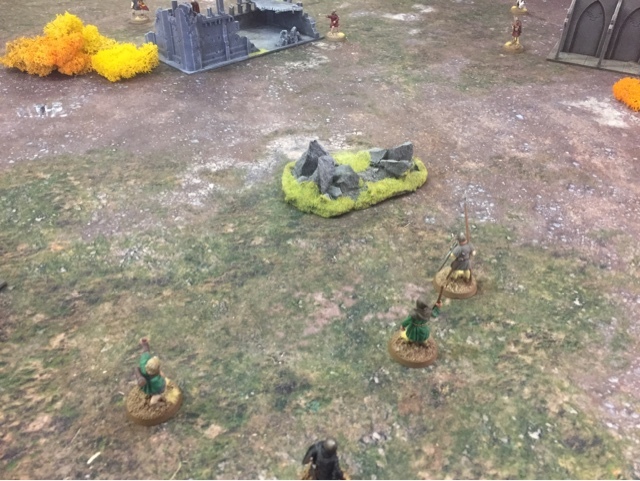 As most of you regular readers know I do a bit of Freelancing as a Wargames journalist from time-to-time... after all, I love this hobby and so it is nice to be able to give something back to the wider community on occasion. 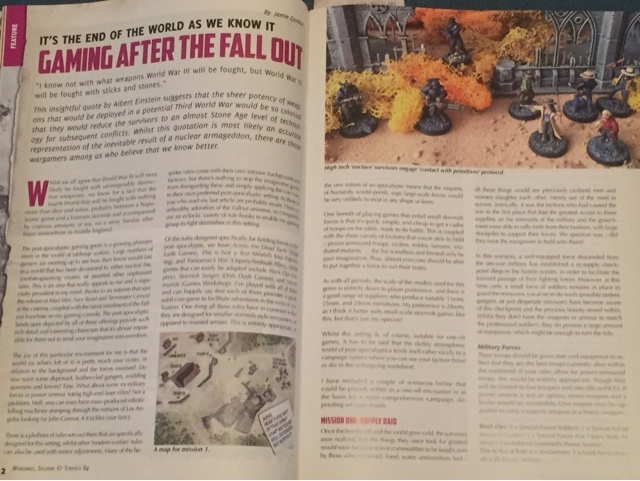 Usually I write for Wargames, Soldiers and Strategy Magazine, but this month I have an article appearing in the recently relaunched/revamped Miniature Wargames. I have been an avid reader of this magazine for well over a decade so it is a real privilege to finally be able to contribute to such an excellent publication. 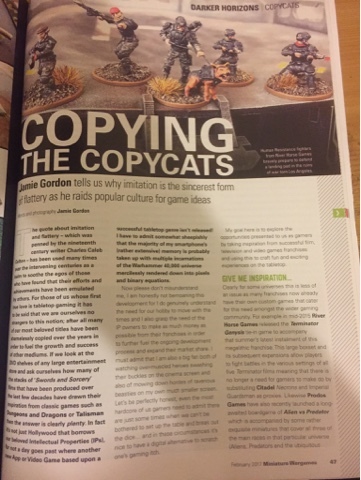 This article is entitled "Copying the Copycats" and it is a piece that explores how we as gamers can draw inspiration from other sources/mediums in order to enhance and develop our own gaming experience. I really enjoyed writing this piece as it gave me some significant food for thought in relation to my own current hobby activities and has given me some interesting ideas for a few projects for 2017! All of the pictures in the piece are mine and the models are predominantly drawn from my Terminator: Genysis and Fallout collections. The one notable exception is the red super-mutant fighting my Brotherhood of Steel Knight in the bottom centre... this rather vicious looking beastie was painted by JB (Asslessman) and the photograph is taken from our massive, multiplayer Fallout game that took place at Bringout Your Lead/Oldhammer Day way back in 2015. I urge you to pick up a copy and give it a read; the magazine is really good since its revitalisation and I think it is an indesipensible hobby tool! Slingers... Will sling stones for food!! Well I've managed to churn out a further two models this week which is pretty good going for the start of 2017. These two fellas are another pair of peasants who could soon find themselves eking out an existence on a backwater planet in the 41st Millenium; exploring the abandoned streets of Frostgrave or on a pilgrimage to the Holy Land in the 12th Century AD. These chaps are armed with some fairly primitive slings that provide some very rudimentary ranged firepower for their Warband. I'm happy with how these guys have turned out utilising my standard mix of Citadel and Foundry paints. These models haven't been varnished yet, and I am reticent to do so as I know it will obscure some of my many layers of blending... particularly on the flesh. This has happened with my previous few models, and it is really frustration to see one's hard work tarnished! Oh well.... Back to the paint station for my next models! 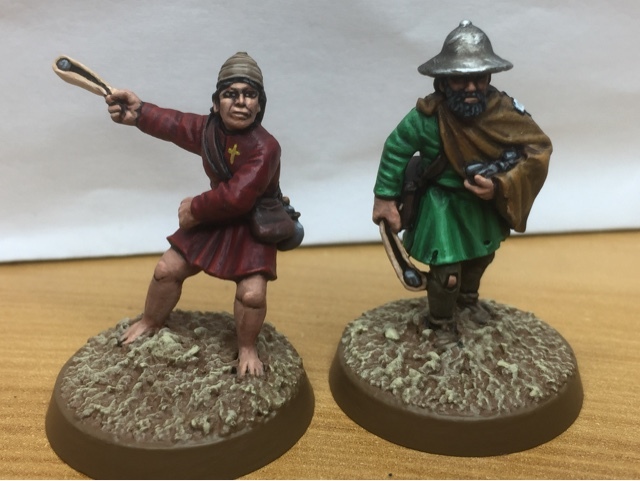 The peasants are revolting...first models of 2017! 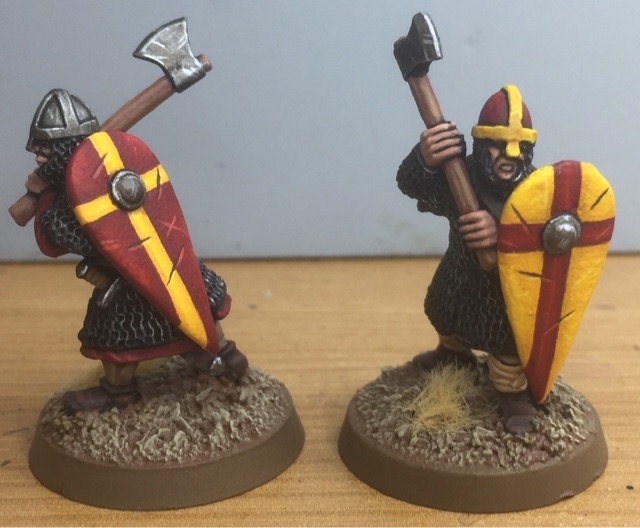 So I've managed to finish my first couple of models for 2017... Nothing special, just some peasants to get me into the swing of things for the next 12 months! I want some more generic civilian/militia models that I can use in a variety of settings and these guys certainly fit the bill as they would slide comfortably into a number of genres. These fellas could easily fit into games of Rogue Trader as dirt farmers on some backward Imperial planet; or as survivors in a post-apocalyptic settlement; members of a Frostgrave Warband or simply as some medieval pilgrims! The versatility of these models is astounding! Excuse the darkness of the photo...bloody winter weather!! One thing that has annoyed me is that the satin varnish I used to protect these guys has obscured the complex layering I did on the flesh of their hands and faces!! 2016...a look back at the last year in the hobby!!!! Well that's 2016 done and dusted, another year gone by.... So let's see what I've achieved hobby wise in the last 365 days! For me it's been a pretty good year, I have had multiple articles published in Wargames, Soldiers and Strategy magazine and I have got a book deal with Osprey Games to publish a set of Wargames rules, both of which are sources of pride for me. Additionally I got my first proper painting commission...and from none other than Joe McCullogh, award winning author of FROSTGRAVE! This was to paint up two full warbands for a project that he is putting together! Again this was a great achievement for me! Anyway here's the year in pictures!